Kashmir: University of Kashmir has signed the MoU with Chanakya IAS Academy to train the civil services aspirants at Kashmir. 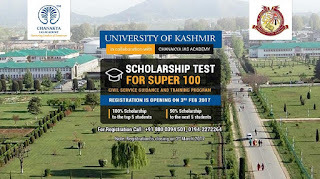 Scholarship test is scheduled to be conducted in Kashmir University in collaboration with Chanakya IAS academy for students of J&K and the registration will start from 3rd February onwards. The scholarship test will be strictly based on UPSC pattern and will be conducted in 3 phases, i.e., Prelims, Mains and Interview. The Prelims examination will be conducted on 5th March 2017, Objective type question of 200 marks with 2 hours of duration based on General studies and CSAT will be asked in the 1st phase of scholarship test. The 1st phase of test will be qualifying in nature without any negative marking. The qualified students will be then eligible to appear in the 2nd phase of scholarship test which will be descriptive in nature which will be held on 19th March2017. Based on the marks obtained in the 2nd phase of test, student will be selected for final interview round which will be held on 2ndth April 2017. The answers sheets will be examined by the experts of Chanakya IAS Academy and the final name of selected meritorious students will be declared on 10th April 2017.